Functional outcomes Archives - Seven Countries Study | The first study to relate diet with cardiovascular disease. Elderly men from Finland, The Netherlands and Italy who became widowed during 10 years of observation had a 2-fold greater risk of disabilities related to instumental activities or mobility than those who did not lose their wives. Widowed men living alone had 75% fewer mobility-related disabilities and 98% fewer basic activities-related disability than those living with other adults. The associations among countries did not differ. In elderly men of the FINE study, duration of widowhood more or less than 5 years was studied according to household composition: living alone, with family, or in an institution. Standardized questionnaires were used for measuring different Activities of Daily Living. Elderly European men with a high level of physical activity at entry had a 54% lower risk of subsequent disability compared to men with a low activity level. This was related to the length of time the physical activities were caried out and not to their intensity. The results suggest that even in old age among relatively healthy men, a physically active lifestyle protects against disability and the duration of such activities appeared more important than their intensity. Different aspects of physical activity and disability were investigated in the FINE study of elderly men from Finland, Italy and The Netherlands, with 10 years of follow-up. Information on self-reported physical activity was based on a validated questionnaire on activities such as walking, biking and gardening. Self-reported disabilities were evaluated with the WHO-questionnaire on Activities of Daily Living. Cardiovascular risk factors associated with disability. Elderly men from Zutphen were divided at baseline in those with a high cardiovascular risk, defined as 2 or more of the following traditional cardiovascular risk factors: obesity, smoking, hypertension, hypercholesterolemia and diabetes and a low-risk group with less than 2 risk factors. Men at baseline with a high cardiovascular risk had compared to those with a low risk a 2-fold or greater risk of functional disabilities after 5, 10 or 15 years. These results suggest that elevated cardiovascular risk factor might prevent or postpone disability. In the Zutphen Elderly Study, traditional cardiovascular risk factors measured in 1985 were evaluated in relation to information on self-reported disabilities collected in 1990, 1995 and 2000. An increasing severity of disability from entry to 5 year follow-up was positively associated with depressive symptoms. Men with no disability scored lower on depressive symptoms than those with disability in any of three domains (see below). The associations were stronger in Finland and Italy than in the Netherlands. Among men with mild disability, whose disability status worsened over 5 years, scored higher on depressive symptoms than those whose status improved. In elderly men from Finland, Italy and the Nethelands, self-reported information on disability and depressive symptoms was collected on 2 surveys, in 1990 and 1995. Three domains of disability were distinguished: instrumental, mobility-related and basic activities using the WHO questionnaire on Activities of Daily Living. In the HALE project, in elderly European men and women disability and need for help increased with advancing age but at the same time decreased over time among more recent generations. Prospective analysis showed a favorable time trend in self care abilities for men and women and in need for self care help in men. Mobility-related disability among men and self care disability among women decreased overall but more in cohorts from the south than from the north of Europe. This suggests that the proportion of elderly people with disability is decreasing and that physical function differs across cultures. Physical function was measured with the self-administered WHO-questionnaire on Activities of Daily Living. Elderly men from Italy and The Netherlands had approximately 50% more self-reported disabilities than those from Finland. 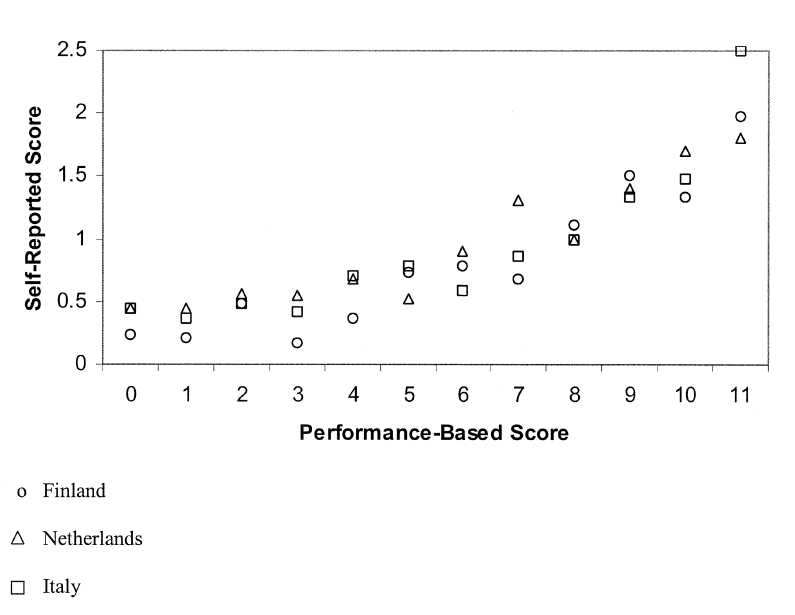 The performance-based limitation score was highest in Italy and lowest in The Netherlands. The number of self-reported disabilities was positively related to the performance-based limitations score and that relation did not differ among countries. Cross-sectional analysis showed that the mean self-reported disability score had a graded relation to the performance-based limitation score in the FINE study. This was confirmed in prosprective data analysis carried out in the Zutphen Elderly Study.